If you happen to be in the vicinity of Nantes, France, you will definitely want to pay a visit to an exhibit entitled "Les Machines de l'Ile Nantes." 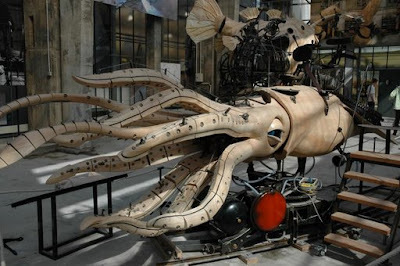 Created by the artists François Delarozière and Pierre Orefice, the exhibit features an astounding variety of mechanical beasts and monsters, including a giant squid! Each enormous machine also functions as a moving vehicle. Oh the things I could do with a squidmobile! See more photos by Claude Joannis here at Dark Roasted Blend! Wow....... I WANT ONE. LOL. Well since we all seem to recommend books i am going to recommend a few. Now i know that most of you read action/fantasy type books but i decided to recommend some books that really are not like those but yet very good books. My recomendations are: The Mary Poppins books.The Mary Poppins books are: Mary Poppins, Mary Poppins Comes back, and i cant remember if Mary Poppins Opens a Door comes next or if it is Mary Poppins in the Park next. The other book i recommend is: Lily B. On the Brink of Cool. That elephant looks so...fierce. And...I dunno...mighty. i wonder if it can paint! It's like Odysseus' Trojan Horse! Except... not. Usually I'm a squid gal all the way, but I prefer the elephant. It's just so... magnificent. Well... I think we know what to get ananka for her birthday. ananka, I know i'm usually not all mushy like this, but i just wanted to say that i'm really glad kiki strike came down my way. I've learned so much from these books and I feel unique knowing all these things that my friends don't. All I can say is thank you very very much. I would like to have a chicken version of those things. When I beep the horn, it'll 'Bawk, bawk!' LoL. It would be cool if the squid one was a submarine and you could take it in the water. 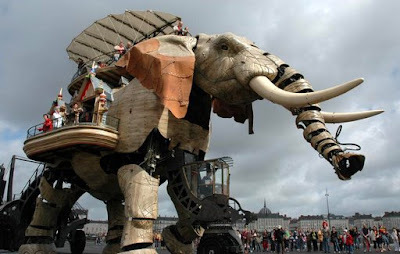 I have been to Nantes, but it was quite a while ago so i never saw these. I hope i can go again, though!! When IS your birthday, anyway, Ananka?